= "an open global cooperative which organizes itself through the Internet and remains off-limits from nation-state control". "Fair.coop is an open global cooperative which organizes itself through the Internet and remains off-limits from nation-state control. Its aim is to make the transition to a new world by reducing as much as possible the economic and social inequalities among human beings, and at the same time gradually contribute to a new global wealth, accessible to all mankind as commons. "Imagine an online cooperative that supports economic equality around the world and is free from state control. This is the vision for Fair.coop. First envisioned by Enric Duran, cofounder of the Catalan Integral Cooperative, Fair.coop is an extension of peer-to-peer values, open cooperation, and hacker ethics. If Fair.coop's lofty ideals are realized in a concrete way, it could prove revolutionary. "Although we started off with different groups linked by an assembly as the organ for decision making, with fair.coop we sought other ways, as a global assembly could be really inconvenient for reaching agreements, however without losing any key features such as open participation, decentralization, respect for minority opinions and autonomy. The proposed method consists of a combination of three methodologies which are usually separated but in fair.coop they complement each other: the Council, collaborative decision making through the social network, and voting. Each of the three forms has its strengths and weaknesses, so it comes to making each of them reinforce and control the others. The council has an advantage on having a visible group behind, trusted by the members, and with the responsibility of making decisions. But it also has the disadvantages of being a closed, small group, implying that by default it does not include the wealth of ideas and points of view from all members. Open participation on Fairnetwork allows collective intelligence to be put to work to produce the best ideas and refine the arguments, plus it’s the closest thing to an assembly in which any dissenting opinion can enrich the commons to generate new consensus; its disadvantage is that, with this virtual format it may become too difficult to reach and implement agreements. Furthermore mistrust, which is often greater in virtual spaces, can hinder its efficiency. Voting‘s disadvantage is to not allow the constructive work of the participants, nor to do qualitative improvements or take responsibility, but it allows a greater numbers participating than any other method, and results are clear and unambiguous. Also, they can be called by different subjects in accordance with the corresponding methodological agreements. None of the three tools could face this challenge by itself, but the three together and can do the job if well employed! To get down to work, first step is to define the game rules in each area of the cooperative which, as it is decentralized, it will start off with 4 provisional councils. Their members will be responsible for developing strategies and making decisions, but only on those topics previously approved by the cooperative. For this end, each provisional council’s first task will be to define a methodology document on how decisions are taken in their field, and especially which topics are decided by the council and which are subjected to cooperative voting. Its first draft will be published on the social network and members will be able to make contributions to it, which the council may or may not include, and once they have a more solid proposal it will be voted. For this document to be approved it must receive at least 75% of votes. It needs a very qualified majority because it is the ground for all other decisions. If approved, the community can start working hereunder, otherwise it will have to keep searching for community proposals that serve to generate a new, better consensus document to be voted again. Likewise for participation to be continuous and avoid any position with community support from being silenced; at any time a group of members will be able to gather support for a voting proposal on FairNetwork and if they get enough support they will be able to call a vote. This minimum number is by default 10% of members but in any case it will be included in the methodology document submitted by the Ecosystem Council. The draft will also make clear whether, how, and under which conditions any council or node is entitled to ban a proposal. This is a possibility about which this promoter group has no specific proposal, but we realize the need for some decision-making space to reflect on how to create balance between the risk of situations that may go against the interest of fair.coop, and centralization of power. Thus, the decision-making process is open and yet to be defined by all of us together. We, as the Faircoop promoter group, provide two tools for decision making: first, debate and discussion groups to share drafts and generate consensus, and second, voting tools. We let councils and the community that elects them define their own decision-making methodology, given it is consistent with the fair.coop principles. "What's the importance of Fair.Coop? Can you briefly describe your vision for the coop? 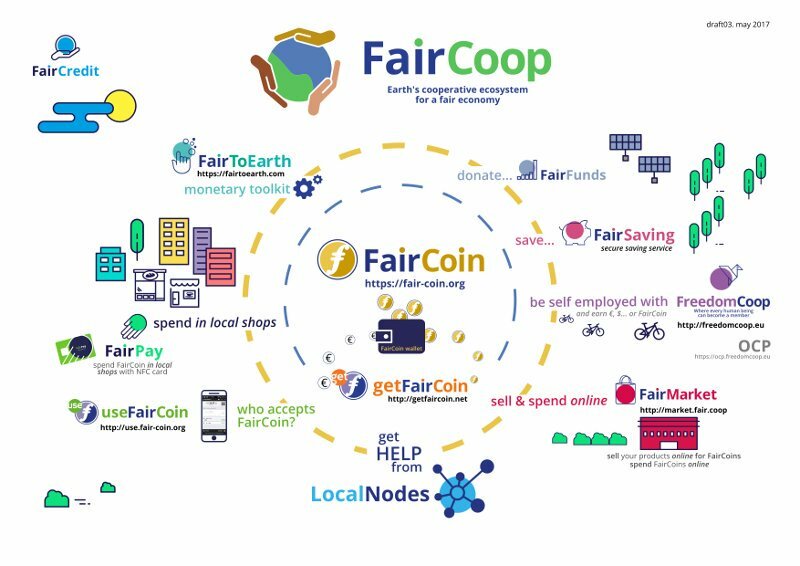 Fair.Coop already holds 20 percent of all Faircoins in existence, which guarantees that the growth of the currency's value will go to the common good. This is guaranteed by Fair.Coop's democratic accountability system What's the CIC's involvement in the project? Is it the driving force behind Fair.Coop and Faircoin? "One of the priority objectives of Fair.coop is to build a new global economic system based on cooperation, ethics, solidarity and justice in our economic relations. In short, as we say at fair.coop, the point is to hack the foreign exchange market by inserting the cooperation virus as a tool for global economic justice. Fairmarket, fair.coop’s virtual market that will allow members to use Faircredit, and anyone to use Faircoin. There is also a Refugees Fund to which we invite contributions in Faircoin or fiat money: https://coopfunding.net/en/campaigns/refugees-fund-faircoop/ - this is the first outward-facing fund to be active, as opposed to funds sustaining FairCoop itself. The infrastructure of the FairCoop is now sufficiently in place for it to be useful, the next step is getting more participation from the public and creating a 'network effect' which will multiply its usefulness." "The key concept for understanding the project’s potential to generate economic resources is the market cap, or market capitalization, which equals the amount of existing coins times the value of one unit. - Fairsaving. Fair.coop’s multi-signature digital wallet, which forces a minimum saving period of 6 months. - Faircoop wallet. Linked p2p multi-sig wallet. - Fairbag. Faircoop wallet service that will allow a trustworthy encrypted backup which can be recovered in an emergency situation. - Fairfunds. At the starting phase, it is important to spread the word and get projects to begin joining and feeding the various funds. In this sense we already have Coopfunding (link) for crowdfunding campaigns for Fairfunds, exchangeable for Faircoins. In this second phase, when the market cap reaches an amount that makes Faircoin generate commercial interest, and while the growth curve of this market cap becomes more moderate, it will grow in importance, creating economic activity both among fair.coop members and worldwide. It is important to understand that the ability to purchase a community’s products and services depends on its total market cap, and therefore trade expansion depends largely on the success of the cryptocurrency vehicle used as a store of value. - Fairfunds: This will be the time to start distributing funds in the form of already-available Faircoin capital, to support participation of projects in the coop’s economic activity during the first year, and to be used freely from the second year on. - Faircredit: Global mutual loan system, supported by Faircoin, the currency to promote its use for production and consumption in the Fair.coop ecosystem. - Fairmarket: Virtual market that will accept Faircoin and Faircredit, allowing Fair.coop members to open their shops with the technological support of the entire platform. - Other projects underway related to generating an autonomous banking system, and facilitating exchange processing tools and the ability to exchange other currencies to Faircoin and Faircredit. The marketplace is being improved step by step. Shipping personalization and territorial fairmarkets, are the next to be deployed. - Freedom Coop. European cooperative society, which will facilite any project in Europe to have a legal platform which can use for making activity, just like Catalan integral Cooperative do. At the same time, Faircoin 2, with an important blockchain innovation is being developed currently. This page was last modified on 6 January 2018, at 16:18.